When Pete and Nancy approached DECO about aquaponics for their business, our team was a little surprised. We have worked with a variety of businesses on all types of environmental sustainability projects, but none of us had worked with a cemetery before. “Why does a cemetery need aquaponics?” We asked. After our first visit to Penn Forest Natural Burial Park, not only were we impressed with everything Pete and Nancy were doing, but the connection between aquaponics and natural burial became incredibly obvious. Aquaponics is a cycle that promotes natural processes and encourages a diverse ecosystem. Nancy, Pete, and the whole Penn Forest team are doing all of these things and more at their site, just up the hill from Verona along the Allegheny River. Opting out of using large gas-powered equipment to clear land at the burial park, Penn Forest allows goats to roam the fields and clear grass and brush at their own pace. The goats also have a cozy barn to enjoy. The roof of the barn is an impervious surface that creates runoff during rainstorms. Instead of allowing the water to run onto the nearby road, which could cause damage downstream and pollute the water, it is directed into a pond where it is stored for reuse. 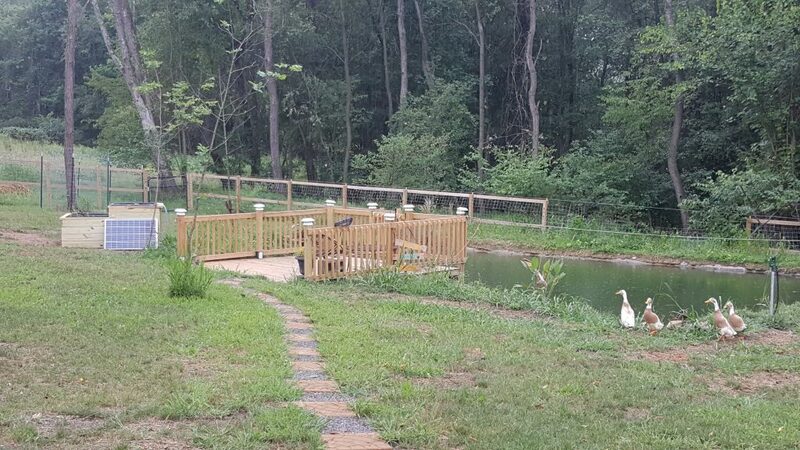 We installed the aquaponics system to treat the captured rainwater from the pond. 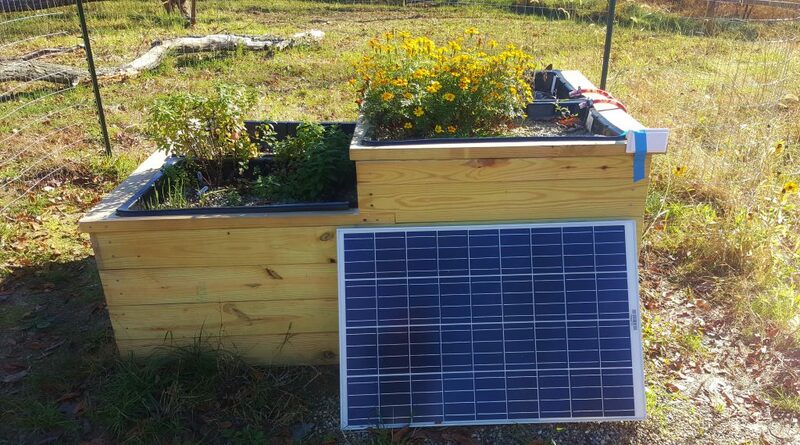 Penn Forest now grows flowers in the aquaponic filtration beds for pollinators. Guests can cut the flowers to lay on graves in the burial park. 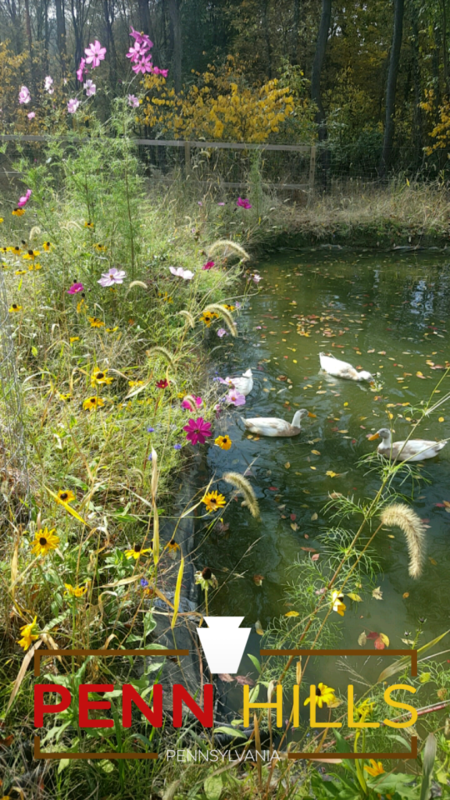 The pond also hosts a variety of wildlife in addition to the ducks, with several types of fish providing nutrients to the pond, including goldfish, bluegill, and bass. The nutrient-rich water is pumped through the plant beds of the aquaponics system where plants consume them, filtering the water. The system also hosts a PittMesh Node (the furthest expansion for the network to date) with support from Meta Mesh Wireless Communities. Along with providing WiFi to park visitors, we will be able to collect data on water quality. We look forward to our continuing partnership with Penn Forest in developing and testing new sustainable technology.